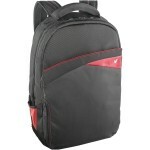 V7 Edge CCD1 Carrying Case for 16.1″ Notebook – Black, Blue – Gucci Polyester The V7 Edge Frontloaderlaptop bag is durable and professional with convenient access to your notebook and essential accessories. 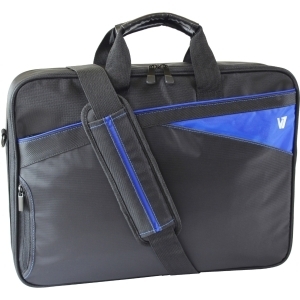 Styled for business casual professionals and their mobile lifestyles, the V7 Edge Frontloaderlaptop bag is accented with trendy blue accents inside and out. 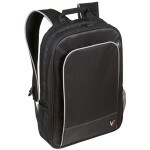 As a portable workstation, the Edge computer bag has ample room for storage and includes accessory pockets, a cellphone pocket, business card holder and a separate file section to keep you organized when traveling from home to the office or on a business trip. The Edge Frontloader features a padded shoulder strap for comfortable carrying and non-slip grip handle. 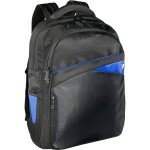 The Edge laptop bag accommodates notebooks with displays up to 16 inches (diagonally).